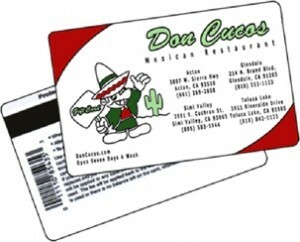 Restaurant membership ID cards come in various forms to serve a variety of purposes. As restaurant gift cards they make excellent presents and can feature a convenient swipe function for checking and updating card balances, and restaurant loyalty ID cards can be used to track and reward those customer who are frequent patrons. As restaurant employee ID cards they can streamline time and attendance tracking, keeping accurate records of the start and finish of employees’ work shifts. Photo ID software can track the coming and going of customers and staff, as well as track customer card usage when the ID card barcode or magnetic stripe is scanned. Restaurant ID cards can be printed on ID cards that can be kept in a wallet, or be printed on keychain ID card tags. ID card key tags are convenient to use, and can also serve indirectly to advertise your restaurant, reminding the customer and all those who see it of your business!